Ch. i.: Cyrus, inspired by Jehovah, permits the Israelites to rebuild the Temple of Jerusalem, and returns to them the golden vessels which had been carried off by Nebuchadnezzar. Ch. ii. : The number of the captives that returned from Babylon to Palestine with Zerubbabel is stated as 42,360, besides 7,337 men servants and women servants and 200 singing men and women. Ch. iii. : Jeshua ben Jozadak and Zerubbabel build the altar, and celebrate the Feast of Tabernacles. In the second year the foundations of the Temple are laid, and the dedication takes place with great rejoicing. Ch. iv. : The adversaries of the Jews, especially the Samaritans, make efforts to hinder the Jews from building the Temple. A letter is written by the Samaritans to Artaxerxes to procure a prohibition of the construction of the Temple, and the work is interrupted till the second year of Darius. Ch. v.: Through the exhortations of the prophets Haggai and Zechariah, Zerubbabel and Jeshua ben Jozadak recommence the building of the Temple. Tatnai, the governor "on this side the river," sends to the king a report of their action. Ch. vi. : Darius finds the decree of Cyrus in the archives of Achmetha (Hamadan), and directs Tatnai not to disturb the Jews in their work. He also exempts them from tribute, and supplies everything necessary for the offerings. The Temple is finished in the month of Adar, in the sixth year of Darius, and is dedicated with great solemnity. Ch. vii. : Artaxerxes gives Ezra a commission to bring with him to Jerusalem all the captives that remain in Babylon. Ch. viii. : Contains a list of the heads of families who returned with Ezra to Palestine. Ezra institutes a fast while on his way to Jerusalem. Ch. ix. : The princes of Israel inform Ezra that many have not repudiated their foreign wives. Ch. x.: Those who have taken strange wives are compelled to send them away and to bring each a sin offering. The canonical Book of Ezra commences where the Chronicles leave off, and indeed with slight variation repeats the last two verses of II Chron. What follows consists of three portions: (1) an account of the return of the exiles, and a brief survey of the fortunes of the Jewish community down to the reign of Xerxes; (2) ch. iv. 7-vi. 22, extracts from a collection of historical documents in Aramaic, illustrating the fortunes of the community in the reigns of Artaxerxes I. and Darius, with a short appendix in Hebrew; (3) ch. vii. to end, a record of the enterprise of the author of the book, including a copy of the decree granted to him by Artaxerxes II., with an account of the author's work at Jerusalem. The first section includes a document also transcribed in Neh. vii. 6-73a, called by Nehemiah a genealogical table of the first return. A third copy is to be found in the apocryphal I Esdras. The documents embodied in the second section are described as "written in Aramaic and 'targumed' in Nehemiah Aramaic" (iv. 7). Since a work can not be translated into the same language as that in which it is composed, the expression "targumed" must mean "described," a sense which corresponds closely to the sense of the Arabic word "tarjamah," which, used of a tradition, signifies the heading in which its contents are described. This phrase, then, implies that the contents of this section were transcribed from a collection of documents and accompanied with a commentary, probably made for the benefit of the Eastern community. In these extracts there is evidently a chronological transposition; for the correspondence with Artaxerxes I. (ch. iv.) is placed before the correspondence with Darius (ch. v., vi. ), who is certainly Darius I. This may be due to momentary confusion on the author's part between Darius I. and Darius II. ; but it is surprising, since in iv. 5-7 he shows himself well acquainted with the order of the Persian kings. Thus the period covered by the commentary on the documents in ch. v. and vi. is earlier than that covered by the documents in ch. iv. The authenticity of the documents is a matter on which there is difference of opinion, the most recent critics (E. Meyer excepted) being disposed to regard all of them as forgeries, whereas before the time of Graetz they were generally thought to be genuine. The custom in use among ancient historians of illustrating their histories by speeches and letters of their own composition makes the treatment of such questions exceedingly difficult. The edict of Cyrus, said to have been found at Achmetha (vi. 3-5), is the boldest of these fabrications, if they be such; but the mention of that ancient capital implies some very remarkable knowledge on the part of the author here excerpted. Some other reasons for believing these documents genuine are alleged by Herzfeld ("Geschichte des Volkes Israel," i. 125). 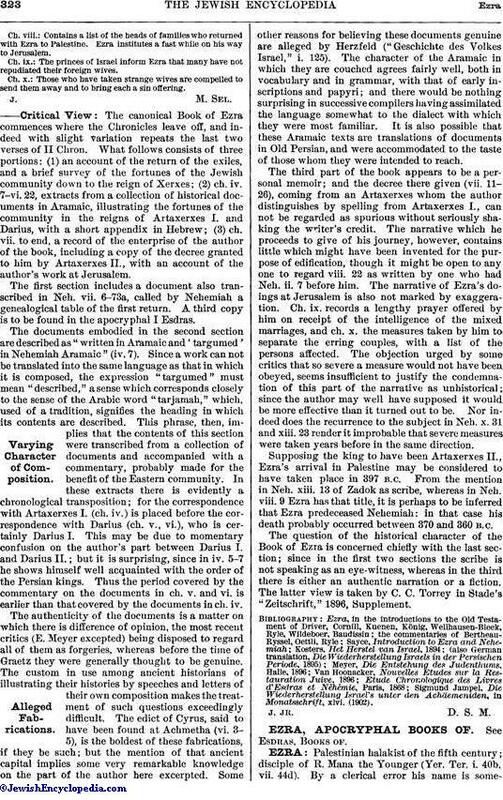 The character of the Aramaic in which they are couched agrees fairly well, both in vocabulary and in grammar, with that of early inscriptions and papyri; and there would be nothing surprising in successive compilers having assimilated the language somewhat to the dialect with which they were most familiar. It is also possible that these Aramaic texts are translations of documents in Old Persian, and were accommodated to the taste of those whom they were intended to reach. The third part of the book appears to be a personal memoir; and the decree there given (vii. 11-26), coming from an Artaxerxes whom the author distinguishes by spelling from Artaxerxes I., can not be regarded as spurious without seriously shaking the writer's credit. The narrative which he proceeds to give of his journey, however, contains little which might have been invented for the purpose of edification, though it might be open to any one to regard viii. 22 as written by one who had Neh. ii. 7 before him. The narrative of Ezra's doings at Jerusalem is also not marked by exaggeration. Ch. ix. records a lengthy prayer offered by him on receipt of the intelligence of the mixed marriages, and ch. x. the measures taken by him to separate the erring couples, with a list of the persons affected. The objection urged by some critics that so severe a measure would not have been obeyed, seems insufficient to justify the condemnation of this part of the narrative as unhistorical; since the author may well have supposed it would be more effective than it turned out to be. Nor indeed does the recurrence to the subject in Neh. x. 31 and xiii. 23 render it improbable that severe measures were taken years before in the same direction. Supposing the king to have been Artaxerxes II., Ezra's arrival in Palestine may be considered to have taken place in 397 B.C. From the mention in Neh. xiii. 13 of Zadok as scribe, whereas in Neh. viii. 9 Ezra has that title, it is perhaps to be inferred that Ezra predeceased Nehemiah: in that case his death probably occurred between 370 and 360 B.C. 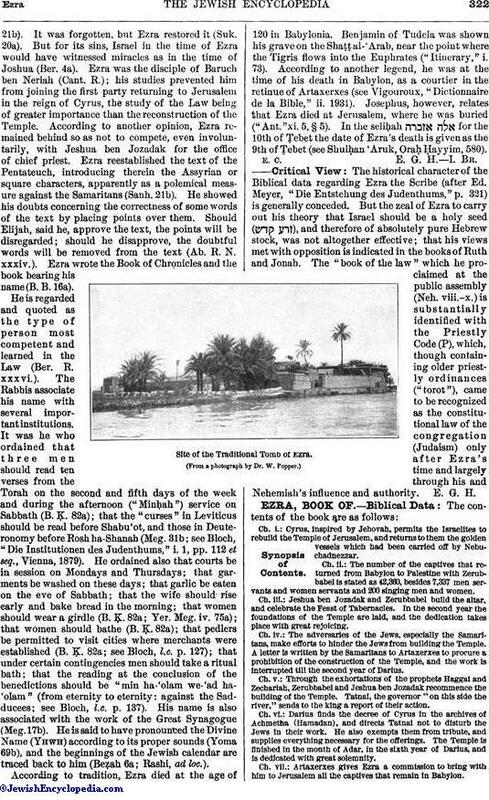 The question of the historical character of the Book of Ezra is concerned chiefly with the last section; since in the first two sections the scribe is not speaking as an eye-witness, whereas in the third there is either an authentic narration or a fiction. The latter view is taken by C. C. Torrey in Stade's "Zeitschrift," 1896, Supplement. Sigmund Jampel, Die Wiederherstellung Israel's unter den Achäemeniden, in Monatsschrift, xlvi. (1902).